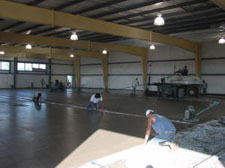 As a commercial concrete contractor in southwestern Pennsylvania, Kishmo, Inc. dedicates itself to be the best concrete contractor in the area. Using the latest technology and focusing on every detail of our process, we will create a problem free addition to any commercial project. With over 20 years of experience, Kishmo, Inc. is one of the most trusted concrete contractors in southwestern Pennsylvania and is capable of any size and any type of job. Kishmo is Penn-DOT Certified in work class codes C1, C3, K, K1, K2, M2, N, N1, Q, S7, X, Z, and ZZ. Established in 1990 as a small personally owned company in Apollo, Pennsylvania, Kishmo, Inc. has expanded into a corporation employing over 20 people and covers all of south-western Pennsylvania. And we're still growing! Many of our employees have 10+ years of experience with our company. That doesn't just happen by luck, we know what we're doing. Our work consists of small-scale excavation, footers, interior slab on grade, exterior pads, site work such as curbs and sidewalks and more. 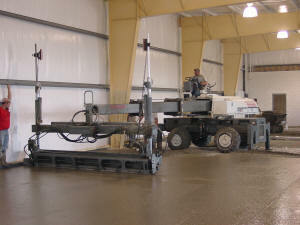 Using the best technology in concrete placement and finishing such as the Somero® SXP Laser Screed, Power Curber® Curb Machine, ride-on power trowels, and Soff-Cut® concrete saws, we can complete the job faster and with higher quality than ever before. When dealing with underground footings, we do all of our own excavation and placement of anchor bolts for footers, grade beams, and piers with our Nikon® Total Stations for the most accurate readings every time. Our mission statement and goal is to satisfy the customer by finishing the work in a timely manner with the most sophisticated equipment and to the utmost quality. Kishmo, Inc. is an active member of leading concrete and industrial related associations locally and across the nation. We are currently members of the following associations. 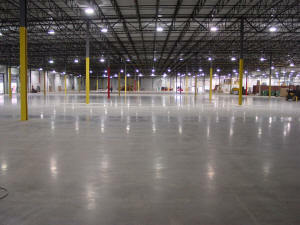 Our work consists of many different types of buildings from warehouses to office space to restaurants. 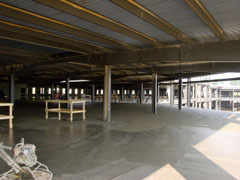 We have the capablity of pouring slabs on grade of any size and in excess of 30,000 SF daily. Also any site work such as sidewalks, patios, or curbs and any under-ground concrete footings. Any size, any type, we are the right choice for your concrete needs. With state of the art equipment, experienced employees, and the resources of a much larger company, Kishmo, Inc. can finish the job much faster and with greater quality than ever before. © 2010 Kishmo, Inc. All rights reserved.